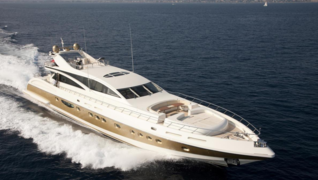 The 43.12 metre motor yacht Tabarakallah, listed for sale by Fabrice Viard at Liberty Yachts, has been sold with Hemmo Bloemers at Yacht Masters introducing the buyer. Designed by Andrea Bacigalupo, she was built in GRP by the Italian yard Italyachts to ABS class and was delivered in 2012 as Hull #3 of a series. She can accommodate 12 guests in five cabins below deck consisting of a master suite, two twins and two VIP suites, all with entertainment centres, television screens and en-suite bathroom facilities. The open-plan saloon has extensive seating on cream coloured settees with metal lined coffee tables, a full wet bar and a formal dining area forward with seating for up to 12 guests. Up on the sun deck is a further wet bar and multiple dining areas, enabling guests to take their ease in the open air. The aft cockpit is fitted with everything needed for al fresco entertaining and dining including built-in bench seating and a table and chairs along with a full wet bar and ice maker. Up on the flybridge are a bar, ice maker, Jacuzzi tub, seating and dining areas sheltered by a hard top while additional protection from the sun is offered by a retractable roller canopy. She has a top speed of 35 knots and cruising speed of 25 knots powered by three MTU 16V 2000 M94 diesel engines.